The St. Dominic Savio Eagles football team suffered its second loss of the season to Class 4A-Division II Salado 42-17. While the Savio Eagles hung tough early with the bigger, deeper Salado Eagles, Salado's depth and talent eventually wore Savio down. This Friday our Eagles face another tough road test against another public school in the Class 2A-Division I undefeated Thrall Tigers in Thrall at 7:30. 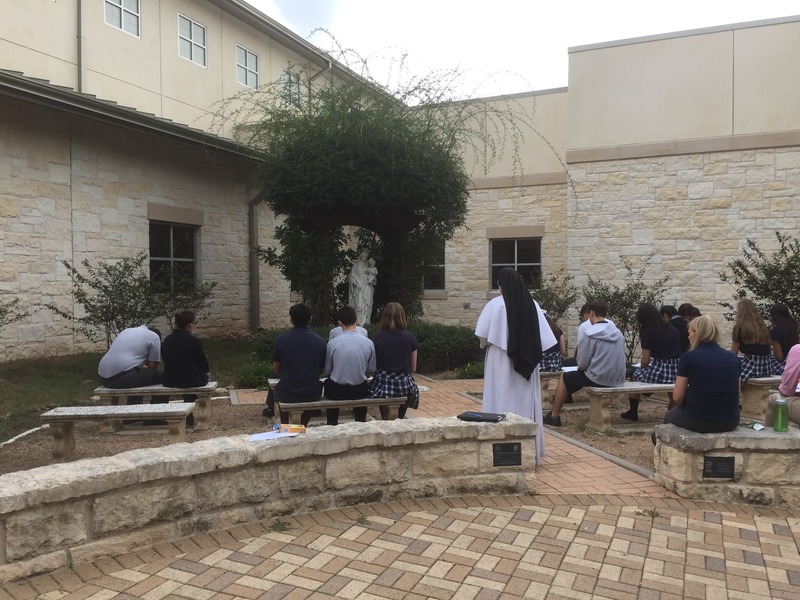 Members of the Timothy Team, a group of Savio peer ministers who serve the school in areas of faith formation, gather for prayer in our Marian Prayer garden. As part of the Timothy Team seminar, these Juniors and Seniors spend class time working to prepare for liturgies, retreats, service opportunities and other faith-building projects. 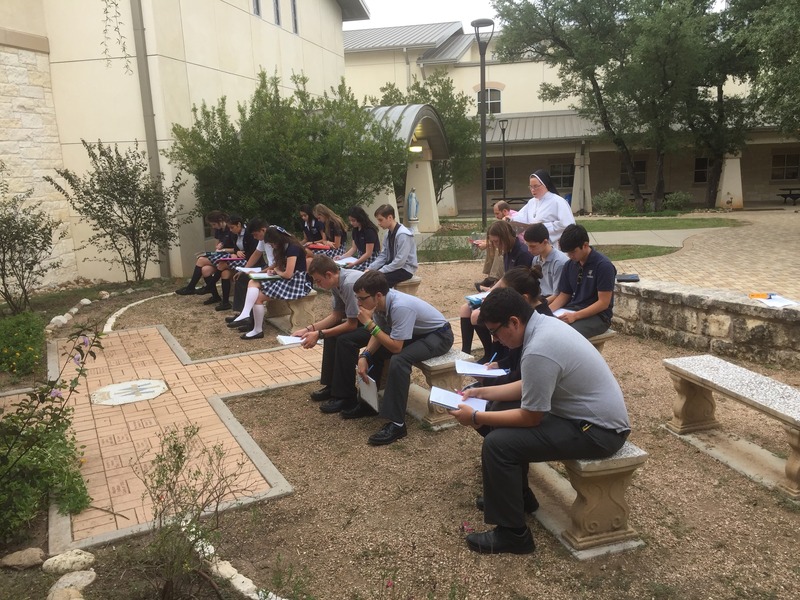 They also read, analyze, and discuss a variety of theological texts and have dedicated time for prayer and reflection in order to help them to grow as servant leaders in the image of Christ in their service to their community. Freshman kicker Nathan French drilled a 42 yard field goal with 47 seconds remaining in the game to give the Eagles a thrilling 17-16 come from behind victory over previously unbeaten Geneva School of Boerne. 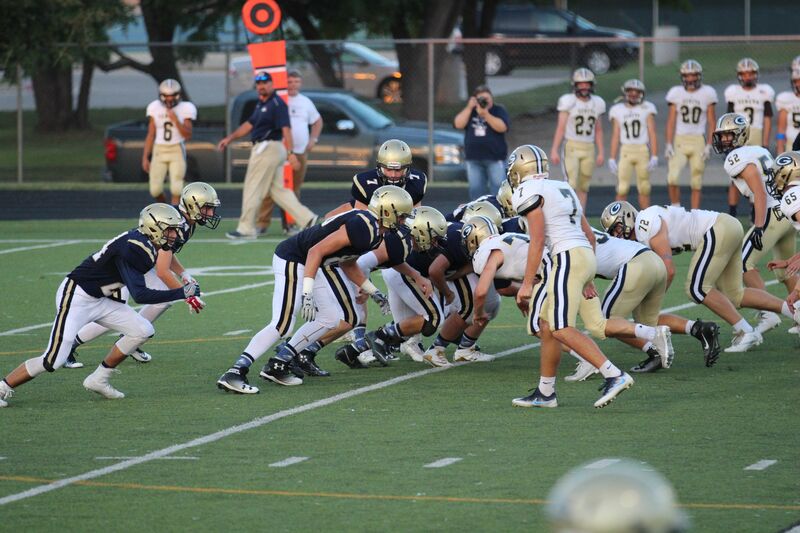 Geneva came into the game with a 23 game win streak over the past two and a half years. It appeared the streak would remain in tact after Geneva took a 16-14 lead late in the game. However Coach Joe Gutilla's Eagles refused to quit and marched the ball to the Geneva 35 to set up French's game winner. Johnny McNaughton's interception on a Geneva Hail Mary sealed it for Savio. The Eagles travel to face Salado High School on Friday at 7:30pm. Today, officials from the National Merit Corporation publically released the list of 2017 National Merit Scholars nationwide. There are approximately 16,000 student semi-finalists this year, in the 62nd annual National Merit Scholarship Program. This year, 18 St. Dominic Savio Catholic High School students are receiving the National Merit Scholar recognition. The National Merit Scholarship Program is a competitive, scholarship program that considers students that fulfill requirements academically, through their extracurricular achievements and through their SAT test scores. To qualify into the National Merit Scholar program, each student takes a preliminary SAT/National Merit Scholarship Qualifying Test (PSAT/NMSQT®). The National Merit Scholarship Qualifying Test screens students by measuring their reading abilities, mathematics problem-solving abilities, and writing abilities. Students that qualify to the semifinals are designated by their state’s percentage of the national total of high school graduating seniors. All semifinalists hold an outstanding academic record and are endorsed by a school official. The SAT scores that High School Juniors take, assesses their test performance and helps to determine if a student will receive National Merit recognition. St. Dominic Savio is proud to announce the 18 student names that are receiving National Merit Recognition this fall. This year represents the highest number of St. Dominic Savio High School students receiving National Merit recognition in its school history. National Merit Semi-finalists: Matthew Bianchi, Eleazar Camez, Daniel Jilek, Charles "Fletch" McCuskey, Emily Shoemaker, Mark Simmons. National Hispanic Scholars: Nicholas Butler, Eleazar Camez, Aaron Mink, Jennifer Sanchez. National Commended Scholars: Michaela Barone, John DiGravio, Jack Frey, Nicholas Isakson, Andrew Kalamarides, Angele Kelly, Natalie Reysa, Thanh Tran, and Ben Wagner. We at Savio, are extremely proud of the achievements of these students who have earned National Merit Recognition. It is a reflection of the dedication of the students, their teachers, and their parents to encourage them to do their very best academic work. This great news supports our belief that St. Dominic Savio Catholic High School provides a high-quality education, where students who apply themselves, can reach their full academic potential and earn national recognition. Read the Summer 2016 edition of "Savio NOW" HERE! St. Dominic Savio's Eagle football team moved their season record to 2-1 with a convincing 48-0 win over Brentwood Christian on Friday night at Westwood. The overflow crowd was treated to an offensive explosion of 485 yards, and a stout Eagle defense that only gave up 88 total yards. 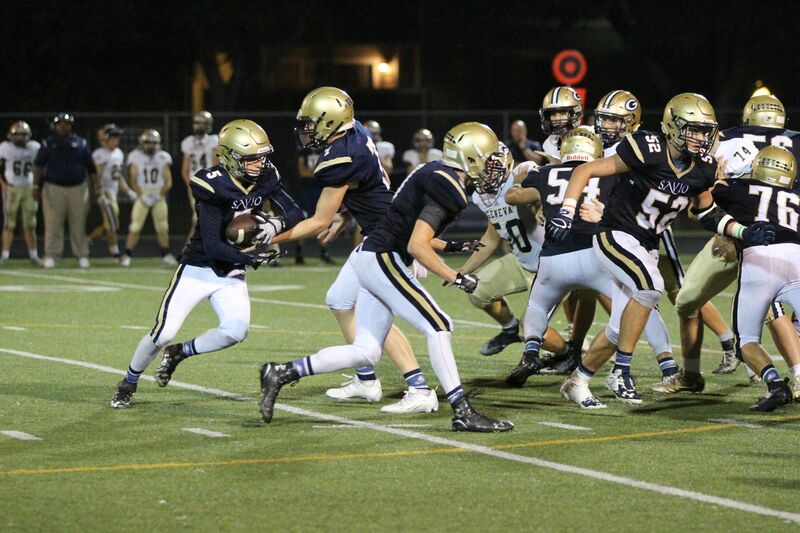 Johnny McNaughton and Skyler Robinson both rushed for over 100 yards each, and Mark Lacayo turned in a solid performance on offense and defense. Will Bradley scored a defensive touchdown intercepting a screen pass. 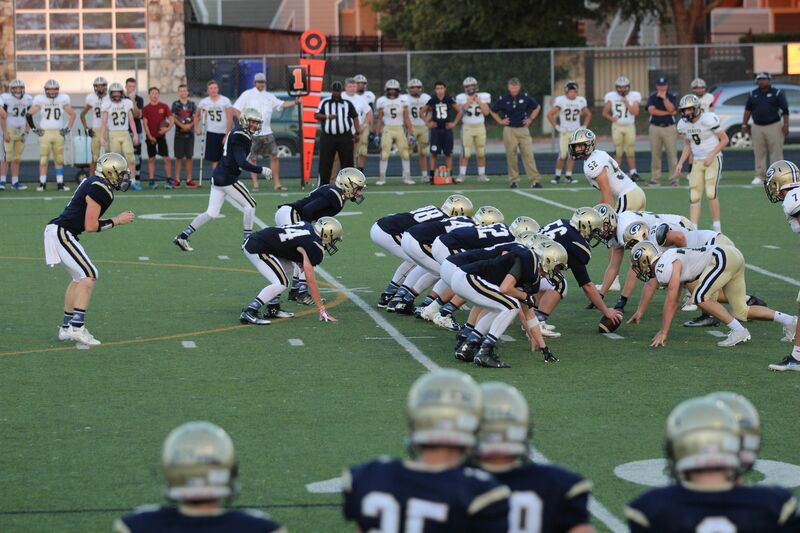 This Friday the Eagles are at home again to take on undefeated Geneva School of Boerne. Game time at 7 pm at Westwood. The St. Dominic Savio football team traveled to San Antonio Friday to take on Division 2 Cornerstone Christian and came away with a thrilling 17-13 win. The Eagles turned in another gritty defensive performance while the offense mustered up enough firepower to stay ahead in the game. Freshman kicker Nathan French's 27 yard field goal with 1:48 remaining in the game sealed the win. The win evens the Eagles record to 1-1 and sets them up for their first home game against Brentwood Christian this Friday at 7pm at Westwood High School.